Come explore the enchanting streets of this thrilling and photogenic metropolis. Follow along with your professional photographer-guide as you explore the most captivating angles of iconic Tokyo, as well as new sites you will not soon forget. All the while, you will demystify the complexities of your camera and learn you how to capture the perfect shot. The Tokyo Day Photo Tour plunges head first into the craziest pedestrian crossing you've ever seen and continues into the back streets of Shibuya before giving you fantastic opportunities to perfect your street photography with the eclectic youth fashion of Harajuku. From street scenes to landmarks, this three-hour private tour teaches photography skills as well as encourages photographic development. 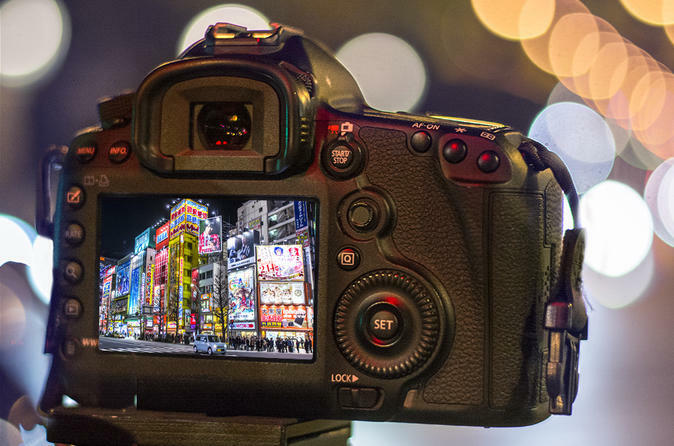 During the Tokyo Night Photo Tour, we will have the opportunity to explore the futuristic setting of Shinjuku. Neon lights, skyscrapers, constantly bustling no matter what the hour. Or we can take things a little calmer around Asakusa and shoot the Buddhist temple Senso-ji and the quiet streets. We know the best spots in Tokyo after dark, and we can teach you how to capture them all superbly. You'll begin each tour in a cafe (coffee provided) where you will explore your level of skill so the tour can be designed for your level of experience and your specific interests. Whether you are a well-worn shooter or this is your first camera, you'll learn tricks and techniques for taking envy-inducing images. Every tour is privately booked so you won’t be sharing your time and attention with strangers, however, feel free to bring along friends and family. All our guides are experienced locals and have plenty of historical stories to tell to help keep the less photographically inclined entertained. You're guaranteed to have an experience of Tokyo you will love, images that will wow your family and friends and skills that will last a lifetime.